So you probably have blog, youtube channel , twitch account, website , PTC account that you have been struggling with, in the making money online hype train. Well this guide is for you especially if you use traffic exchanges. You can skip to what you want. 1- You need to sign up at Signup or Login to view earning guides for mobile apps and websites. Now go back to the website after signing up to add your website. Each website has different settings the addsite page looks like this. The settings above will be okay for most websites. The ones below are a bit more advanced. This tutorials are bit fast we might recommend learning a bit of javacsript in detail.But I will show you its not that hard. Banner ads are also okay but tiny buttons its better to use the Javscript Injection. The rest of the settings are self explanatory see below. Note :This are just settings that I experimented with but you can still customise them. The following should be settings. Visit Duration : 30 secs to 60 secs is fine . Higher the better especially for Youtube. Maximum per hour: keep it at around 100 but you can increase it if you want. Why 100-500 most people click objects at the center of the page. Click Trigger : 3 secs to 5 secs. This means after 3 secs to 5 secs after the page is loaded the click will be triggered. You must be asking your self all this settings how do you come up with them and how do they work? Can I adjust them and see results immediately? Well we have developed a tool for testing websites before you put them on the traffic exchange. Download it Signup or Login to view earning guides for mobile apps and websites. Switch to the settings tab and enter you website settings. You can experiment with different settings. Once you have a preferred setting click Simulate Visit. This simulates the way a viewer on the Traffic Exchange would view your website. 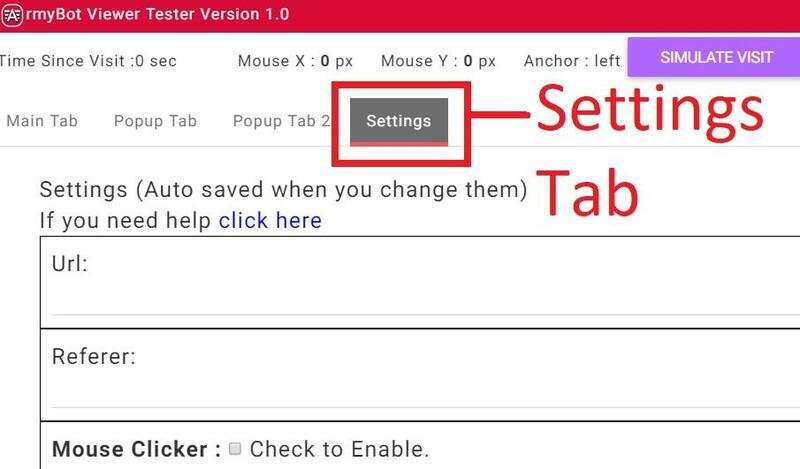 Manual trigger help you execute settings without loading the website. 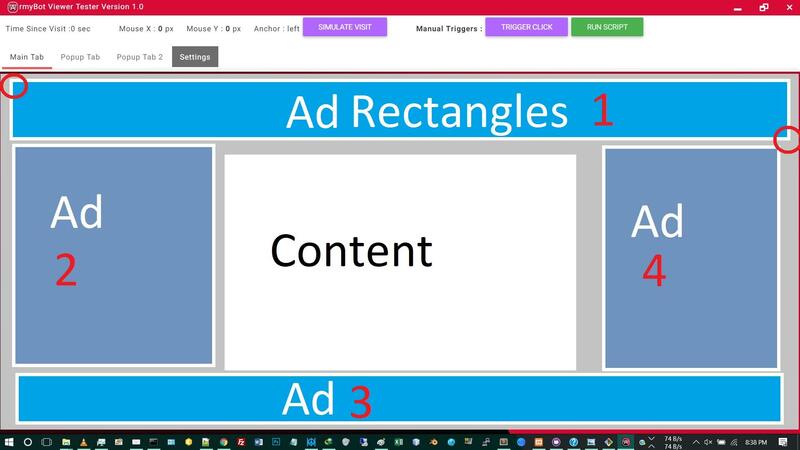 For this guide we will click Ad recangle 1. Place you mouse on the Top Left part of the banner ad first. 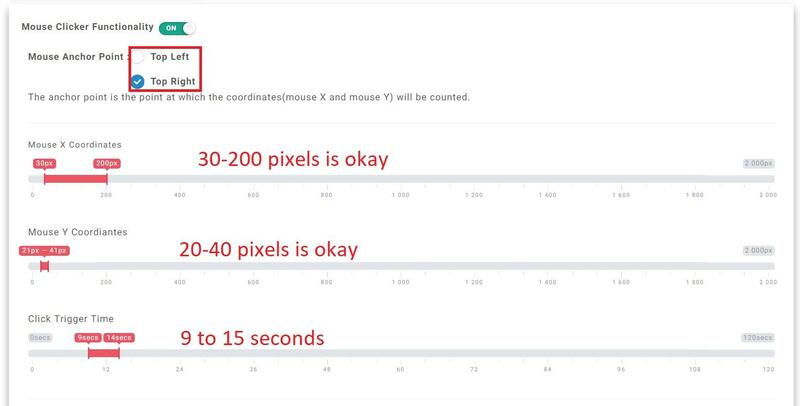 Read the mouse X and mouse Y indicated. Place you mouse on the Bottom Right part of the banner ad. Now your settings should be. Click Trigger: Time you want the banner ad to be clicked. To achieve this you have two options. This websites ideally only pay you when someone clicks a button. 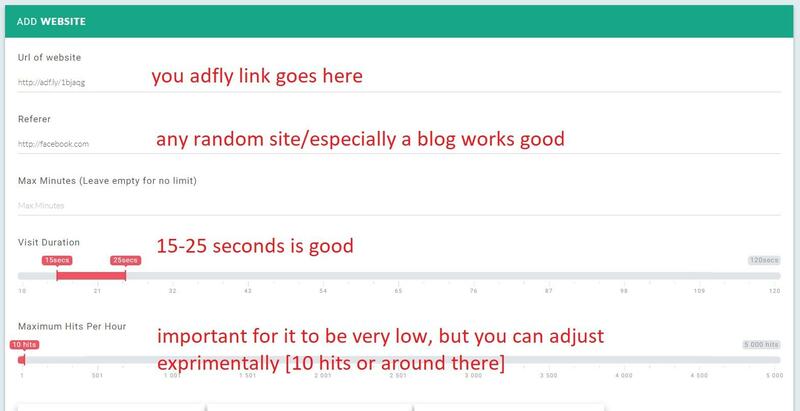 See my adfly guide first to get a greater understanding. 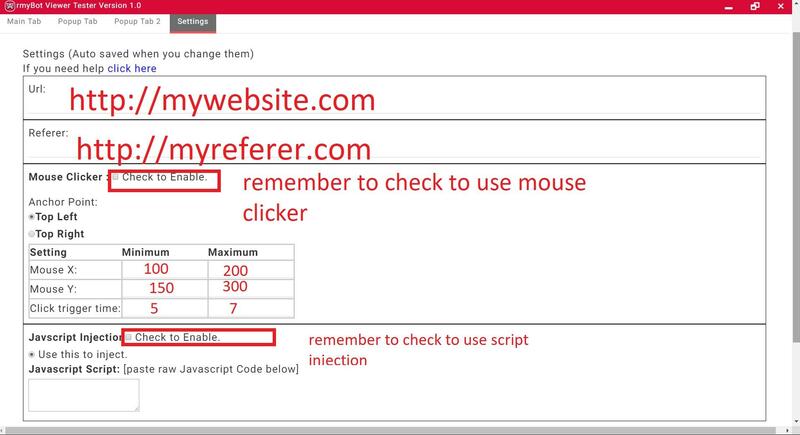 Mouse Clicker - Follow the banner ad guide for this. Maximum per hour: keep it at around 10 but you can increase it if you want,but not too much.Really important to keep it very low. Injection method you can use either link or raw code. Raw code : is an option for uploading you Javscript code on our server and using it as you please using a drop down. The above code only works for adfly. It works by sending a click event to the button once the page is loaded.It does this multiple times (at different times) hence a guarantee that the button is clicked. It looks complicated but its not. Please create a new account. Since this method has not undergone thorough testing we don't want you main account banned.BTW this method can work for other link shrinking services too with a few minor adjustments. So let me explain the methods we are going to use. A Mouse clicker->click the skip ad button. This involves injecting a script when the page is loaded that 'clicks' the button.It does not actually click it .It calls the function that the button has been assigned.To ***** its kinda the same to them. For other link shrinker services this method will work but only with another injection link. I might create more in the future you can also create you own script and host it some where.Premium user can host/upload it on the website itself (Armybot) but no need for that now. 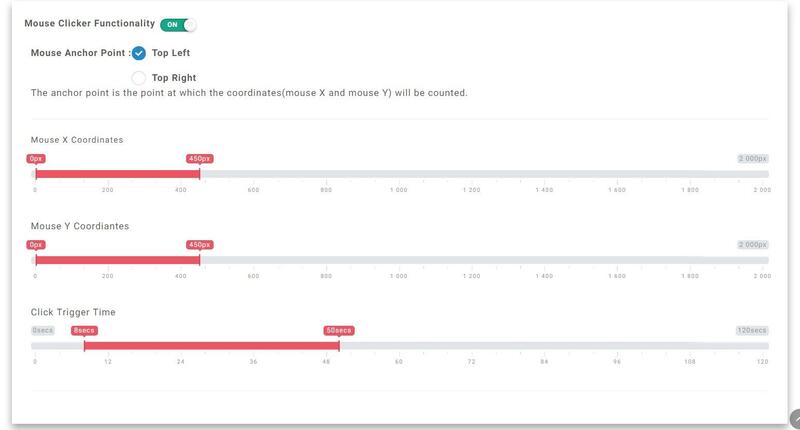 This method involves faking an actual mouse.It fakes a left mouse button click on the cooridinates given. Basically point and shoot. You can see more Signup or Login to view earning guides for mobile apps and websites. Basically you want your sliders to be within mine.The closer together the better but leave abit of space between them. The click trigger time is the time the click is triggered after the page is loaded.You want its highest number to be less than you minimum duration time. BTW Top Right should be checked. You can use both methods at the same time if you want. From my user experience on adfly this is how adfly bans accounts and counts hits.Similar to most link shrinking sites. They count hits mostly only when the adfly skip ad button is clicked.We covered this so you should be okay. They ban account based on a few things. I will cover the ones I have seen. If people dont click the skip ad button they will say that you are using a traffic exchange .Since the ratio of clicks to views should be close to 1 view : 1 click but on using most TE without mouse click the ratio is 1 view : 0 clicks. IP based bans.In real life One IP does not view 100 adfly pages a day.Roughly in a real scenario one IP visits less than 10 adfly pages a day. 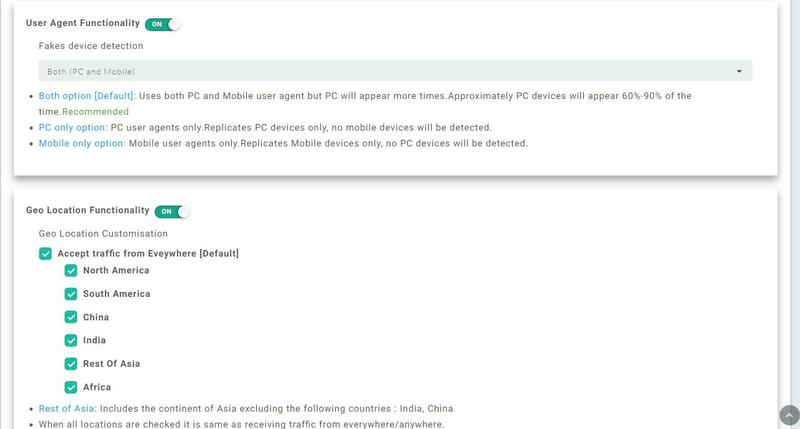 This is one of the reasons you might get banned using armybot.net because all IPs on the network might have visited alot of adfly pages before yours. How to beat this...well the only way is use this method without guarantee or try it on other not so famous link shrinking sites that are not common within the Traffic Exchange. Reason why the counts on ***** and hits will never match. you get the idea...well that's the sad truth. But as the TE is growing rapidly you will still get good quantity of hits. We don't allow shortened links, so they have been replaced with the direct links. Too many complicated. I am already overwhelmed after reading first few lines. So i just skip it. The biggest problem with traffic exchanges is support for pŎrŊ websites... so how does that work here? Can someone confirms that this works on Youtube now a days?